I’ll forgive you if you thought we were talking about herring. But no, we are indeed talking about a Swiss gin from the team behind the nginious! line of gins, which we’ll be seeing more of in the coming weeks on here, thanks to David T. Smith who brought me some samples during a recent get together in California. Using chestnuts, which are cold smoked for 40 (!) hours, and are subsequently macerated in spirit with ginger, quince, bitter orange, coriander and juniper, the smoked nuts are only half of the equation. The salt is a special salt known as Sel À L’Ancienne and comes from the Alps, is then smoked itself (double smoked gin!) on the boards of the deciduous Larch pine (a pine that loses its needles in winter? ), which means that the smoked salt is absorbing aromas from the wood, saps and tars as well, adding complexity and piney nuance. Salted cocktails are beginning to get a following, but salt in spirits is altogether quite rare. The nose of Smoked & Salted Gin has traditional gin nuance at the top with juniper, coriander and bitter orange; just underneath evocative, but only gently smokey notes like cherry wood smoke that reminds me a bit of smoked oysters, with burnt sugar on the edges. Tasting though, you realize what a wild ride this is. Crisp, leaning traditional notes at the front, orange rind, and juniper. Pine notes forward, a slight tinge of spicy/citrusy coriander mid-palate, smoky notes begin mid-palate coming on strongly towards the finish on the back of the palate. Notes of smoked ham and oyster, becoming only gently briny and savory with salty pecans and citrus rind. But wow, this is the most beautiful, most well executed smoked gin I’ve tasted. It’s perfectly in balance with the other gin botanicals, and there’s no trace of sulfitic/burnt rubber nor fake smoke type notes often found in other smoked gins. If you had asked me before, I might have said that I wasn’t sure a smoked gin could work. I’m wrong. It does, and it’s right here. This is a brilliant gin which pushes the envelope but actually pulls it off. Smoked & Salted Gin is certainly not for everyone. I mean, I think cocktails are really hit or miss. Florals like the Aviation just don’t work for me, and I could really leave the combination of lime, sweet and smoke, so I’m not doing a Gimlet either. Mint and smoke has some surprising consonance, so maybe a Southside. I didn’t love Smoked & Salted Gin with Tonic either, but I loved the Martini. Herbal spirits play up the smoke and combine to create a savory, robust, umami-rich, aperitif cocktail. And speaking of Aperitif, my favorite place for smoked gins before this was the Negroni, and this is no exception. This sure isn’t for everyone, but if you hear the word “smoked and salted gin” and think that sounds good, then I’ve got good news for you. It is, and this is for you. Buy nginious! 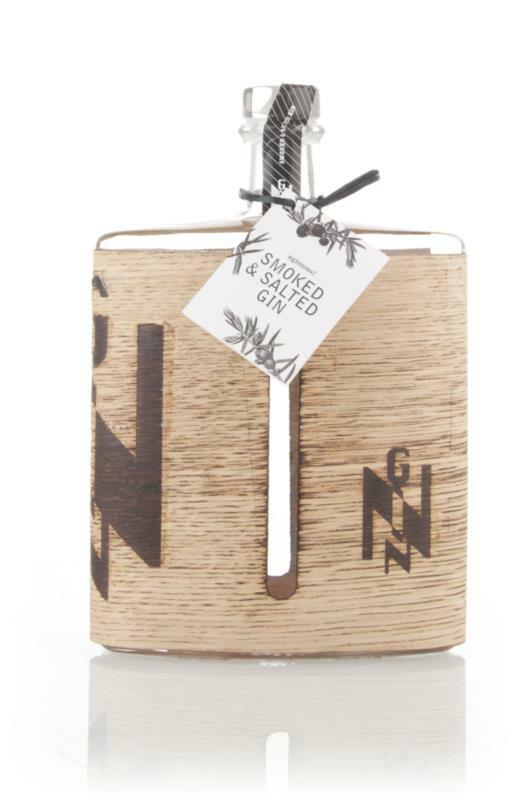 Smoked & Salted Gin for drinking on its own aperitif style or mix a Martini. Gin-purists might be left wondering “what has this world come to,” but this is why I write about gin. To see an exciting risk executed this well while still tasting like… well a gin? Cheers, cheers indeed.